It's always best to be prepared. And when you find yourself in the honoured position of being a bridesmaid, you'd best be prepared to do anything that might help your bride. To that effect, a wedding day survival kit is a great way at making sure any task can be done. It's a few simple items that can make the difference between the day going off without a hitch and you're bride in a heap against the bathroom door, pulling her hair out. Gather a few of these items in a bag for the big day, and she'll be forever grateful and willing to return the favour on your wedding day. Yip, this is essential. Pack a mini kit with thread, needles and a few buttons. If a dress rips and needs some emergency TLC, a mini sewing kit should do the trick. Crying at a wedding is not uncommon. These handy travel size tissues will fit into your clutch bag, or into a grooms man's pocket for those teary eyed moments. Don't let your bride walk down the aisle with remnants of her pre-wedding snacks following her around. Get a mini bottle and pass it around before the walk down the aisle, ensuring the bride is minty fresh and ready for her first kiss as a wife. Two words. High Heels. For those not versed in the art of walking in heels, blisters are bound to creep up and become a pain. Sort it out quickly and effectively with some plasters. The small round one's will be discreet too. This is the perfect tool for quickly and effectively hiding any last minute stains and smudges that may be on the wedding dress. Perfect for stocking runs and touching up a manicure. Also carry the shade that the bride is wearing for any last minute touch ups. Headaches can be such a nuisance! Carry a small pack of pain killers to curb those mood killers. Yes, strange hey? It won't be so strange when your bride needs a last minute sip of water. No lipstick smudges, thank you very much. Keep those lips perfectly kissable with a pot of lip balm. Prevent the mortifying chance of your bride passing out on the alter by keeping a few Granola or health bars on hand. They're quick and easy to eat and they'll sustain her energy levels for a long time. 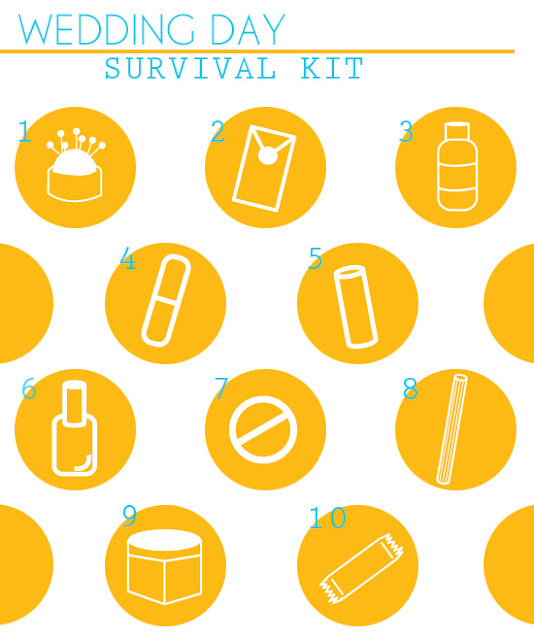 Those are our top ten wedding day survival kits items - what would you include in yours?